The offshore substation, built on the ENGIE Fabricom site in Hoboken, will team up with its identical sister substation to supply green energy to 400,000 households in the UK. 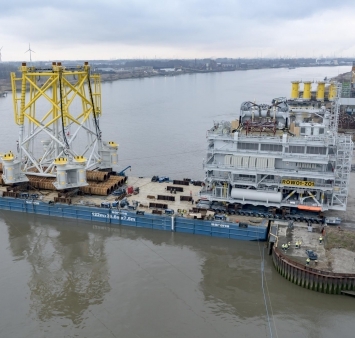 ENGIE Fabricom and Iemants, the consortium chosen by Dong Energy to build the Race Bank 1 offshore substation, reported on Sunday 5 March that the substation sailed from the ENGIE Fabricom site in Hoboken (Belgium) bound for the wind farm off England's east coast. The Race Bank wind farm consists of two substations and 91 6-MW wind turbines and lies 16.8 miles (27.0 km) off the coast of Norfolk The Race Bank wind farm has a total capacity of 573 MW and will generate enough green electricity for 400,000 households in the UK. The wind farm should be fully operational in 2018. Shipping the substation requires meticulous planning and is only possible at high tide. The topside structure is 35 metres high and weighs 2,900 tonnes. The jacket and piles weigh another 2,600 tonnes. On February 17, 2017, Race Bank 1 was removed from its base on the site and put on the pontoon in a process known as 'loading out'. This morning between 7.30 and 8 a.m., various tugboats surrounded the barge. At 9 a.m., at high tide, the mooring lines were removed and the ship could sail away. Dong Energy awarded the contract for building five substations to the ENGIE Fabricom/Iemants consortium. ENGIE Fabricom is in charge of the entire construction and commissioning on site, while Iemants is responsible for the steel construction work on the five substations. The first of the five substations, the Burbo Bank substation, left the site in June last year and Race Bank 2 was fitted out in August 2016. Following Race Bank 1, this month the Walney 3 & 4 substations will also depart from Hoboken. This is not the first time that Dong Energy has called on the ENGIE Fabricom/Iemants consortium for a substation construction project. In 2012, it supplied two substations for London Array (RWE and Dong Energy), and in 2013 the substation for West of Duddon Sands. In 2014, the consortium supplied two offshore substations for the Gode Wind 1 & 2 wind farm. 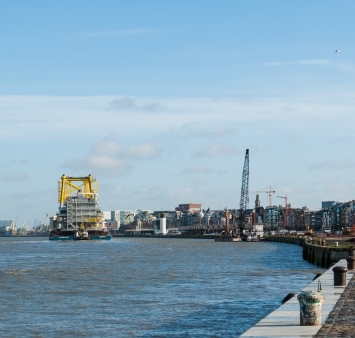 ENGIE Fabricom and Iemants have built a solid expertise in building substations for offshore wind farms, having previously constructed substations for offshore wind farms off the coasts of Belgium, the Netherlands, Germany and the UK. The substations are entirely built in a huge assembly hall on the ENGIE Fabricom site in Hoboken (Belgium) and are shipped out from there.